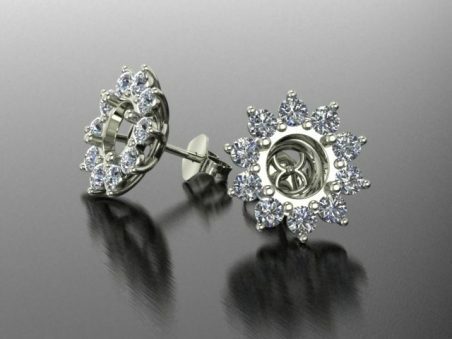 The ideal setting to highlight good weight in carat coloured gems or diamonds, this earring setting have surrounding brilliant cut diamonds with daisy shaped wire prongs. Available with pressure butterfly closure, screw or clip fastening. Ideal for gems form 1 to 2 carats and oval, round brilliant, teardrop, cabochon, cushion, trillion, octagonal cut. Lot Colour G, clarity VS, brilliant round cut, very good. Pair of Aquamarine, oval cut, 1.61 ct tot. Pair of Alexandrites, cushion cut, 0.37 ct tot. Pair of Rubies, oval cut, 1.65 ct tot. Pair of pink tourmalines, round cut, 3.98 ct tot. Pair of Tsavorite, drop cut, 0.97 ct tot. Pair of blue sapphires, teardrop cut, 2.84 ct tot. Pair of emeralds, teardrop cut, 1.89 ct tot. Pair of Colombian Emeralds, octagonal cut 0.91 ct tot. Pair of Colombian Emeralds, octagonal cut 0.74 ct tot. Pair of Emeralds, drop cut, 1.68 ct tot.